Do you remember the Y2K babies…the four million+ little ones born into the tail end of the first internet boom? Like the mysterious cicadas, these equally mysterious young people have emerged from their not-always-comfortable kid cocoons and have started graduating from high school and pouring into the world. They overran the college application process. They’ve taken all the men’s medium t-shirts and women’s size 7 shoes. They have used ALL THE DATA. They’re eating all the frozen yogurt and have taken up every seat on flights to Europe. Dear God, I hope they are finding their way to their polling places. These kids were just little chubby babies on September 11, 2001, and our perspective and hopes for them changed in an instant, and continued to change again and again with the awful and exciting things that tend to happen through a person’s lifetime. Inventions. Wars. Societal and political shifts. Natural disasters. Personal heartbreak and triumph. Epic movie franchises and broken sports curses. It’s time for them to figure out their way. Our way depends on it. The options for Y2K babies are different than those of every generation before them. We’re sending them into a weird world – where the possibilities feel infinite and finite, depending on the day. We (I) can’t unload our (my) panic about the mysterious state of the world onto them (him). These new adults are Post Millennials. And it seems, while we were trying to make things so great, we’ve done everything in our power to make things as difficult as possible for them. As a proud Gen X parent, I feel like we’ve quietly put up with a lot, but we didn’t use any of that experience to help these kids. And so to you adorable group of Y2K baby graduates, I say…sorry, guys! College admission is insanely competitive, and infinitely more expensive than what we had to deal with…tuition has gone up 260% since 1980, while other consumer goods have only gone up 120%. We’ve made it prohibitive in every way. You’re welcome! We’ve re-wired your brains with our own lack of self control with technology – forcing our own addiction on you, then we get frustrated with how much you look at your little screen. We shrug and turn to you – firmly resting our collective future onto your young shoulders. You’ll need to fix the environment and health care and race relations because it’s too hard and we can’t do it. You’ll have to fix education – good luck since we messed that up pretty good (see above re: prohibitive)! We’ve known for a long time what keeps you healthy, but sorry – we’ve put sugar and garbage in everything you consume. We haven’t fixed equity or equality of any kind. Sorry! We have only anecdotally modeled volunteerism, civic engagement, patience, kindness, generosity, and creative freedom. We haven’t let you explore your neighborhood, goofy hobbies, free time, play time or diversity. You need to overcome a lot – us – to get to where you need to go….and not just where you need to go, but where you want to go. Because, let’s face it, we don’t know what you need. If we did, you sure wouldn’t be in this pickle! However, I do know that WE NEED YOU! You’ve gone from being the children entrusted to us, to being our new co-workers, team members, fellow citizens and allies. When you moved your tassel to the other side of your fancy flat hat, that’s what you got…a graduation party, and a seat at the table that should have been occupied by you all along. Thank God for us, it looks like you nerds know what you are doing. You’re smart, in spite of us, kind in spite of us, connected in spite of us. And yes, though you may not want our help anymore, we are in it together. We obviously can’t do it for you, but maybe if we work together, we can move the needle. Hope you enjoyed your two days of sleeping in, you’re needed on the floor. In our small house, there was no mistaking when Mary Jo was leaving for work. She click-clacked across our tile in her sling-back pumps; her dozens of keys jingling with a celebratory clatter announcing to the world that all was well, the keys had been located, probably in a side pocket of a 40-pound purse or under the pile of mail on the kitchen counter. In our tight-knit neighborhood, there was no mistaking when Mary Jo was leaving for work. The echoes of her signature door slam and engine rev, pin-balled between the tract houses. If you were lucky enough to be standing in your yard when she tore out of the driveway, you were on the receiving end of an enthusiastic wave, and had a good view of her careening around the corner in our Chrysler Cordoba…a vehicle so long, my friends thought our family had a limousine. She was not much older then, than I am now. Like me, she was a mom to two kids constructed of 80% freckles, and 20% defiance; and again like me, married to a great husband/awesome dad who adored her, but wished she could relax, just a little bit. She made breakfast, lunch and dinner each day, breaking sometimes for Sunday outings to Sizzler or Kentucky Fried Chicken. She ironed every piece of clothing that touched my body. She reminded me often, that she’d won an ironing contest when she was in high school. She let me roller skate in the house. She fought her speeding ticket in traffic court, and won. She was concerned, when at 14, I watched a VHS copy of “Heathers” or “Gleaming the Cube” every day after school. Before there were rules about parents yelling from the sidelines at kids’ sporting events, she yelled from the sidelines…but only because she was my number one fan. For a while, she told every grocery checker where her kids went to college. These days, she shows those same checkers pictures of her four grandkids, and of the roast my husband cooked on Christmas. I was 24 when I finally apologized to her for how I acted when I was 18. I was 26, and only weeks into motherhood, when I acknowledged that being a mom was not exactly easy, and it must have been…not exactly easy for her either. I thought of her when I careened out of work to get a kid to baseball practice. And somewhere over the course of my almost 16 years of motherhood so far, there was a precise moment when I realized my children weren’t spending their every waking moment marveling at all that I get done in a day. It was that precise moment when I became Mary Jo’s number one fan. I always knew her as a working mom. Not a high profile executive. Not a woman bent on dynamiting the glass ceiling… a suburban mom, taking care of business, so her daughter could do whatever she wanted when the time came. Mary Jo was just a kid when she learned shorthand and bookkeeping. I remember her perched at our kitchen counter working late into the night. Her fingers, strong from years on a manual typewriter, flew over the keys of her Selectric. She worked for the railroad, a loan company, and an elementary school. Her bosses had mustaches, cowboy boots and long cars, too. She worked hard and cared hard and she did it all without needing to blog about it or escape into sacred girls’ nights out. And now, at 81, she’s still a working mom. When she’s tired, I tell her she she should quit her job, and she tells me she’ll quit when she’s good and ready. She’s tougher than I am, and always will be. Chances are your mom’s tougher than you too. They were tough so we wouldn’t have to be. Motherhood is taking care of business. It’s careening. It’s click-clacking through the house and caring what your kids watch after school. It’s bragging about them to people who don’t care. It’s making sure Taco Tuesdays happen on Tuesdays. It’s wanting to yell from the sidelines, stopping yourself, then yelling just a little bit. It’s deciding only to quit when you’re good and ready. Motherhood is being somebody’s number one fan. This is just a snapshot of what Mother’s Day means to me…my hard working mom and hard-working mom-in-law Ruthie…two awesome broads who are taking care of business and loving their families fiercely. Mothers Day might be something else to you. A hard day. A sad day. Here’s to everybody out there who’s taking care of someone – showing compassion, working hard, putting on a bandage, listening, loving, praying, feeding, guiding, giving, hugging, bragging, and changing the lyrics when necessary. Where could I have been dragging the children, that was such a nightmare? What on earth could have evoked such desperation and sheer terror? Not prison. Not a hard labor camp. Not the dentist. It was The Container Store. While the children begged for clemency, I tried to contain how excited I was to have a perfectly valid, legitimate reason for going to The Container Store…not even one of my usual made-up reasons. I needed a laundry drying rack…. a big industrial-sized model, because I am never not doing laundry. I had nothing but the welfare of our family in mind. My last drying rack had just collapsed in defeat, a stack of plastic knobs and metal pipes, finally done in by the weight of yet another uniform, and another pair of jeans I was trying to preserve for their human occupant who was just going to fall in mud or grow two feet the next day, anyway. I needed a drying rack because I still haven’t figured out all of the weird sporty, wicking fabrics the males in this house wear. The material of all that gym/basketball/baseball/running stuff feels so delicate, though I could probably dry all of it by running over it with a tractor and it would be fine. I didn’t need a dorm-sized drying rack. I needed the one that professional football teams use. I’m a professional. They pleaded their case, but it wasn’t enough. We were going to the store whether they liked it or not, which is one of the necessary realities of childhood, and of parenthood, too. Just that morning, they had already woken up to beautiful sunshine, had been fed pancakes AND hot chocolate, and then suffered through another store where I had unsuccessfully looked for a laundry rack, yet successfully found a new lasagna pan, a pan I would soon use to make them a lasagna. Quelle horreur! The Container Store contains more containers than I could ever use in my lifetime. They are colorful, lovely boxes and bins and bags stacked to the sky, each representing the hope of what could be…beauty and order harnessing the chaos. I don’t think that’s what my kids see. And I guess I see something different in the stores they prefer. Those stores represent the hope of what could be for them…zombies to be pursued, goals to be made, races won. Two months before my drying rack quest, I went into the video game store on the release day of “Some game with Zombies,” and I vowed loudly, “never again.” I’ve waited on the sidewalk when they go in ever since. I go with John to those stores that sells TVs and phone cases and wires of every shape and size, and my eyes glaze over. If I fall behind and lose him, I wonder around, saying “John?” to all the other brown haired guys in khakis and button down shirts. You can’t make someone love The Container Store, and you can’t make someone love the wire store or the video game store. It turns out a 41-year-old mom is – often, not always – different than a 10-year-old boy and a 15-year-old boy and a 42-year-old boy. And that’s fine, and that’s one of the reasons there are Girls Nights Out and Man Caves. On that day in The Container Store, the boys knew what would happen, even when I didn’t. They knew I wasn’t just running in for an enormous best-drying-rack ever that would fill the car’s trunk. They knew it would be something else too. And there it was, the ultimate container…a huge plastic box designed to hold our artificial Christmas tree. The one they held on their laps without complaint as we drove the six minutes home. I’ve already vowed to hold the zombie game on my lap the next time we drive home from their store. I hadn’t forgotten this blog. In fact I thought of it often, but found that just like everybody else around here, most moments during the notoriously crazy start of fall were wrapped up in work – kid work, house work, work work, and the annual duties surrounding prepping the DVR for a new season of TV. And during the most frenzied moments, oh, how I longed for the calm, predictability, and parameters that routines seem to give the serene and well-rested families I read about in parenting articles. Those parents have it together. They have systems. They know what’s for dinner next Thursday. They are never stumped. Most striking, they are not afraid to say no when they need to, and their kids thrive within their well-appointed boundaries. The routinized life I’ve haphazardly aspired to through the years, has always been just beyond my half-hearted reach. So if I’m not that, I must be spontaneous and carefree! I must welcome every new opportunity to come our way in the interest of raising curious and whimsical little adventurers! I know plenty of people in that category too. They say, “YES! Of course!” They run headlong into life with great gusto and imaginative barefoot kids in tow. But….no. I tap-dance between the two– feeling equally ill at ease in both approaches to parenting. It’s exhausting for me and certainly confusing for the kids; especially when they’re already stuck in their own kid-sized limbo, figuring out where the little boy stops and the big kid begins. Which brings me to the issue at hand: the morph suit. Oh you haven’t seen it? You would remember if you had – once you see it, you can’t unsee it. The morph suit is a Halloween costume – conveniently available in children’s and disturbing adult sizes. It appears to be a one-piece stretchy leotard, designed to cover every inch of a person — hands, body, feet, and the whole head, including the wearer’s face. It’s reminiscent of the horribly scary rubber suit that kept popping up in the promos for the first season of the hit TV show I never watched, American Horror Story; or the lesser-known, just-as-creepy “Human Being” mascot suit from a show I always watch, Community. The costume catalog arrived in the mail from one of our local party stores. Most households likely tossed theirs out with the Pennysaver before it ever hit their kitchen counter top. Not us. For days, the boys pored over the catalog’s flimsy pages examining every wacky, gory, cartoony, super-heroic option. But they always came back to the morph suit. I stumbled out to the kitchen early one morning to find the catalog on the counter where I couldn’t miss it. 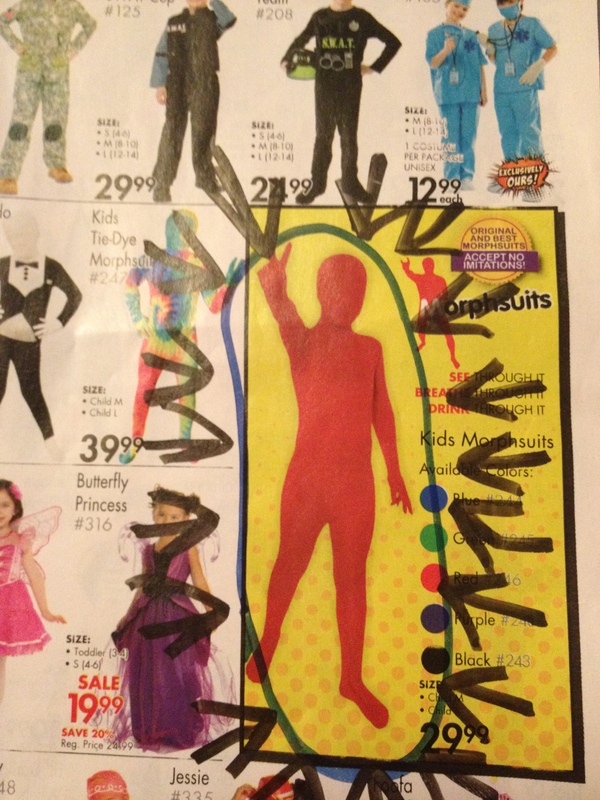 The red morph suit was circled and surrounded by a dozen subtly drawn arrows. You know what they say though, better to wake up to a picture of the morph suit, than wake up to the morph suit. The 7-year-old shrugged and moved on to the Avengers page. The 12-year-old mumbled in agreement, but stood in front of the morph suit display when we finally made it to the store (effective catalog mailing, Party City!). Zach was thrilled that (spoiler alert) Captain America was still in stock, as well as the a la carte shield and gloves. After carefully considering the pros and cons of the Captain America suit with the built-in muscles, he opted for the slimmer, standard non-muscled version citing flexibility, breathability, comfort, and ease of storage as its winning qualities. “The morph suit is not happening,” I told Jake, as he stood looking at more morph suit options than even the catalog had boasted. “I know. I don’t even care, I’m over Halloween anyway. I’ll just hand out candy,” he said. Had my flippant dismissal of the (still-terrible) morph suit sullied his last gasp for his little boy-hood? I took him down the next aisle in a quick attempt to preserve his childhood. “How about you dress as a rocker? Mobster? 80’s guy? 70’s guy?” I was just pointing out a mullet wig, when an old friend and her 12-year-old daughter appeared in the aisle. Zach, having found a new audience, immediately launched into the laundry list of why the muscle-free Captain America might just be the best costume in the history of Halloween. Before saying our goodbyes, the tweens mumbled back and forth in some kind of primitive communication that conveniently allowed them to act as though the other person did not exist, as only 12-year-olds can do. We made our Captain America purchase and Jake left empty-handed. By the time we got to the car, he was chattering about his science project and asking about lunch. 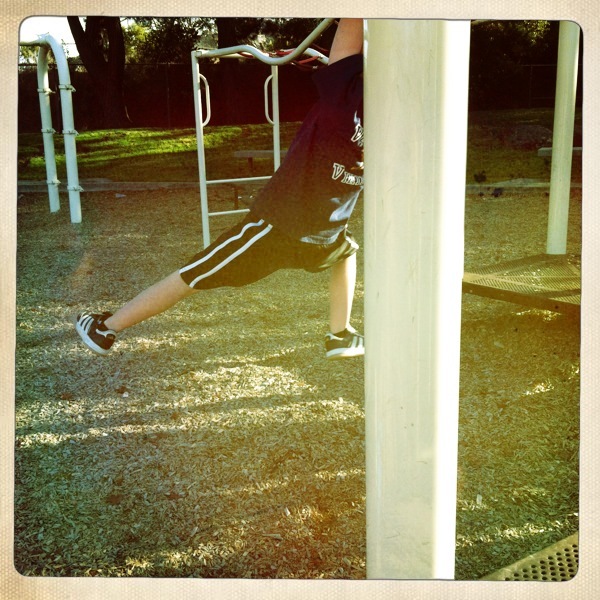 Transitions are hard and helping your kids navigate the pitfalls of adolescence is no picnic. It can be fun to say yes with abandon, but sometimes the one thing I bring with me to the parenting table is that I too, was once in middle school. Sure, saying no to the morph suit may have been a big bummer, but it’s better than sitting in math class wishing you were wearing pants. Have you ever witnessed something that you immediately realized could only be experienced, and never adequately described? I did, and let me describe it. 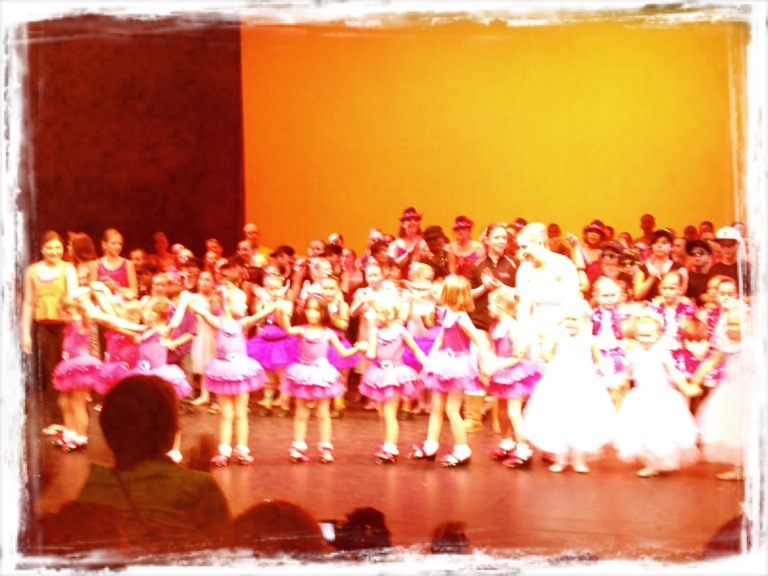 It was the end-of-the-year dance showcase that my youngest son just happened to be a part of. This dance extraveganza is a long-standing tradition for our neighborhood dance school and likely similar to shows in any town with a tap class and a kid with a dream. Or maybe any town with a jazz class and a kid from one county over, where dancing isn’t allowed – so when Kevin Bacon the kid isn’t angry-dancing in the barn to the cassette in his tape deck, he’s sneaking over the county line to blow off steam the only way he knows how – with a kick ball change, pivot, barrel turn. As for our 6-year-old, he simply wanted to unleash his hip hop moves onto an unsuspecting world. Just like most little boys are sure they are born naturals at martial arts, they are also “natural” breakdancers. The first week in class, Zach realized his “natural” abilities could use some guidance and fine tuning, so week after week, he would run excitedly into the dance studio with his new buddies to grapevine, learn the snake and spin an imaginary record to JJ Fad’s classic, “Supersonic,” after the teacher with-the-patience-of-a-saint explained what a record was. And week after week, the hip hop parents stood squished together in the hall watching every rehearsal through a window while complimenting each other for being way more chill than those other dance parents, like, oh I don’t know, maybe the ballet moms down the hall. Weeks turned into months until the big day finally arrived. With the costumes on, the hair done, and audience packed into the theater, the rest of the afternoon was uncomfortably out of our hands. There would be no last minute hugs or gentle reminders of which foot was in fact, the left one. My older son Jacob sat next to me fidgeting in his seat undoubtedly uncomfortable with the acute lack of texting that was about to happen for him. I couldn’t believe it either. I would not have exactly been first in line for a ticket if my kid weren’t in it. I have no patience for talent shows on TV. As a kid, I could hardly sit through an episode of “The Gong Show,” without having to leave the room when things got weird or uncomfortable. The embarrassment I felt on behalf of the contestants was simply too much to bear. But, as the curtain rose, my breath caught in my throat, and in true Colleen fashion, the tears came. I was overwhelmed with emotion, and my own kid wasn’t anywhere in sight. He wouldn’t be for quite some time; his 3-minute dance was 33rd in the line-up, near the very end of this 2+ hour operation. But I didn’t have to know these kids to tear up for them. From 3-year old cowgirls, to 10 year-olds tapping to Lady Gaga, and to the ethereal, lithe ballerinas who’d been training since they were the pint-size cowgirls – they showed the lucky ones in the audience what happens when you mix joy with talent and hard work. These little stinkers were amazing. And there, close to the end, was Zach’s little group. They were an instant hit, and danced their way through cheers and whoops and hollers. Sure, the Gen X parents went immediately bananas when they heard JJ Fad’s signature devastating beats; but these kids were not just cute, they were having a blast, dancing their little hip hop-loving hearts out. 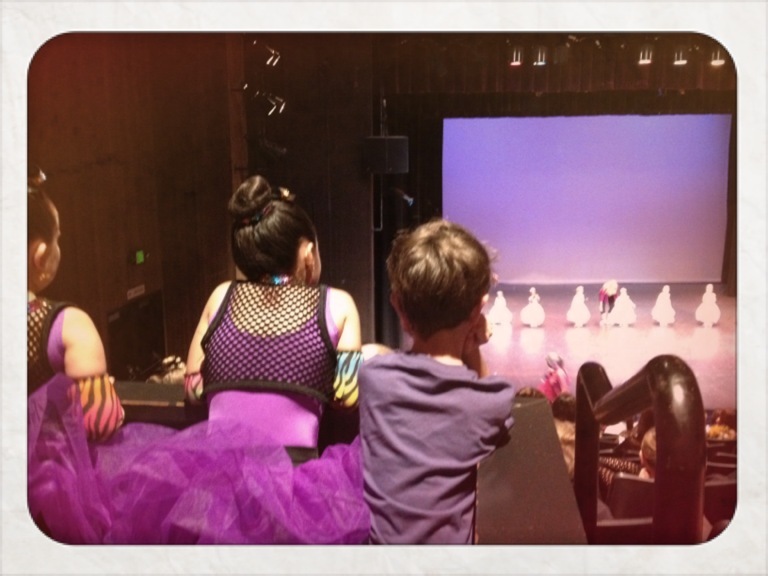 We didn’t buy tickets to see a parade of dance prodigies – the chances of these kids growing up to be professional dancers, were likely similar to those of the kids at any baseball field growing up to be Buster Posey. We didn’t even come to be entertained. We came to support our sweet, regular, goofy kids who happen to work very hard at their fun hobby – a hobby that also happily counts as exercise. We came to cheer and encourage and support. We came to be nervous for them, then excited, then relieved. We also came because most of these kids can’t drive, and they needed rides. It represented months of stern discussion, a few tears, plenty of exasperation, and a smattering of time-outs (some for me, some for the boys) – but what we had collected was quite the impressive arsenal of kid weaponry. Colorful plastic, wood, fabric, and foam. Pointy things, blunt things, long things and short things. Things that shoot, things that poke; but mostly things that whack, hit and pummel. The pile started innocently enough with a foam dart gun. I don’t recall the exact circumstances that resulted in its confiscation, but likely someone was shot in the eye, and did not like it. It was taken away, and hoisted atop my lovely bedroom armoire where neither boy could reach. Then we added the padded bat (I believe someone was walloped and did not like it), a light saber and an Indiana Jones whip, then the other two light sabers and the other three padded bats. A football jersey made it up there at some point, followed by the football, and one out of two of the hockey sticks. There was a potato gun, three foam golf clubs, and the foam dart rifle that went straight from the original package to the pile, with nary a stop in between. The old western six-shooter actually took longer to be put up there than I thought it would. Within one week, Zach lost both of his chef knives – one from his basic kitchen set, the other a wooden cleaver from the sushi set. The pile teetered as the gun barrels hung precariously off the edges of the armoire. ”Confiscation Station” was bursting at the seams. “Fine.” His brother was not home. I retrieved it easily, and handed it to Zachary. I knew exactly where it was in the pile because it was the first thing I saw every morning when I woke up. Zach returned the potato gun when his mysterious potato-gun-necessitating activity was complete, and I placed it back in its spot, no questions asked. Confiscation Station had become storage…and could easily pass as the gun locker for a deranged but adorable teddy bear, with a penchant for golf and baseball. The boys eventually forgot about the stuff up there and focused on LEGOs and some made-up game that involved diving onto the couch and yelling at each other. Hoping we could sneak it all back into place without re-piquing their interest, John and I quietly cleared out Confiscation Station. I woke up and cheerily surveyed the newly cleaned off, cleared out grown-up space that could now be left to collect dust in peace. The knives were first to return, followed by the light sabers and the bats, and then finally the dart guns. 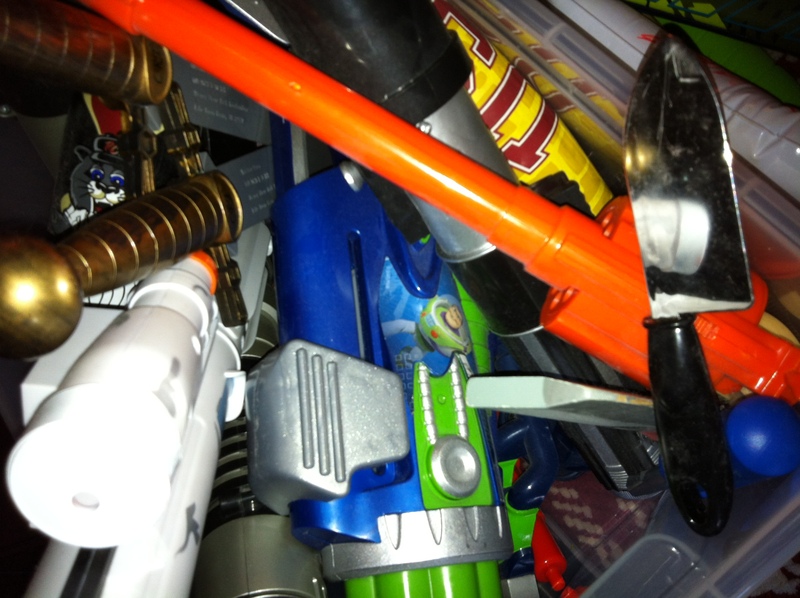 We acquired two Disney swords that fit nicely in the crevices created by the Storm Trooper gun and the six-shooter. Then I needed to have a place to keep things from the cat. Up went two half deflated balloons and a spool of curly ribbon. I drove up to the house the other night, and our bedroom curtain was open just enough for the pile to be revealed in all its glory, perfectly framed by our outdoor Christmas lights. I had never seen the pile from that angle before. It was architecturally and structurally impressive, sure, but it also looked like the window of a person sorely in need of some kind of intervention. “Good points!” I would say back to you. They are boys, but I don’t think boys should get poked in the eye either, and tomorrow, when their arms are longer than they are today, their reach will extend beyond the “thiiiis close” distance to the TV/Window/my face/the cat/other faces they have enjoyed thus far. We did not intend to accumulate so many weapons, it just happened. We didn’t head out one day on a stockpiling mission with an arsenal shopping list. They have grandparents, uncles and birthday parties, and moments at Target where I am weak and they have a gift card, and they do not like my suggestion of drawing paper or a new knit cap. I dismantled the pile again after spying it through the window, but the contents have not been put back into the boys’ rooms. Instead, they have found a new home in the bin recently vacated by the Power Rangers, who though adored by young Jacob, have been (mercifully) ignored by Zach. The spot is clear once more, just in time for Christmas. *A potato gun IS pretty cool. You stick the barrel into a potato, and it takes out a little potato plug/bullet, that you can then shoot. Searching for and collecting the spent potato bullets will make you feel like a farmer AND a CSI. The boys prefer to leave me at home when they go to the park. For a while I had unapologetically forbidden them from visiting the playground down the street. There were no sides on the tall slide, and the bottom where kids were supposed to slow to a stop was just sheared off metal. The ground cover seemed to be equal parts tan bark, glass shards, and cat/dog/raccoon/deer/fox/mountain lion/horse poop. There’s a lake in that park; it’s practically the wilderness. But then the city went and replaced it with brand new play equipment and that space aged spongy ground cover; I had to find some other danger to fret about. The New York Times ran an article this summer citing a study that our new safe playgrounds may be depriving an entire generation of the adventure, risk, reward, accomplishment, and self esteem necessary for them to become healthy and well balanced adults. Worse than the potential injuries, we might be instilling more fear and more anxiety into our kids by keeping them too safe. I don’t know…I fell out of a tree house once, and that’s likely why I boast a fairly healthy anxiety about my kids falling off of, or out of, stuff. The rule of my childhood neighbor’s tree house was you could use the ladder going up, but you had to jump out of the tree to get down. I now know that was likely not sanctioned by their parents, but….a rule is a rule. I scooted to the edge of the five or six planks that were nailed together to create the “house” and sat there for a long time. When I’d gathered enough courage, or had succumbed to the peer pressure, I gave myself one final push, at which point my favorite lavender eyelet shorts hooked onto a wayward nail. There I dangled cartoonlike by my shorts from a tree with no way for the other little kids to get me down. Those adorable shorts finally gave way, sending me plummeting to earth. It hurt like the dickens but I miraculously didn’t break anything, other than my shorts. I limped home, blubbering, and covering my rear end with my bruised and bleeding hands. The crowning jewel of the Sierra Gardens Elementary playground was the Eagle’s Nest that sat outside Room 5. 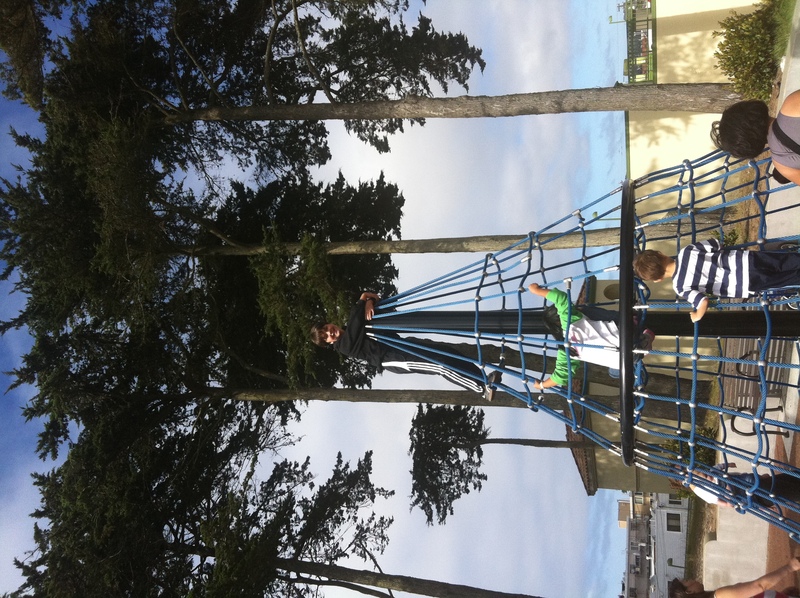 Kids would race to scramble up the side of the rounded metal climbing structure, hoping to be the first to reach the pinnacle where they could sit and survey their kingdom, the Sir Edmund Hillary of 2nd grade. Sometimes, you would climb back down the side, or, on a dare, you would let yourself hang from the top before your sweaty hands would give out, dropping you down into the sawdust. I spent many a lunch recess across the blacktop at the simple bar that was cemented into the ground by the swings, and designed solely for the purpose of swinging around and flying off, like Mary Lou Retton. Every trick had a dramatic name; of which I now only remember pieces: The Cherry Something, Dead Man’s Something (which should have been named the Arm Breaker), and The Such-and-Such Drop, with all of the two-handed, one-handed, backward and forward variations. There was never ever enough sawdust to actually cushion a fall, and I’m fairly certain that’s where I said my first swear word. Modern playgrounds still look plenty dangerous to me. 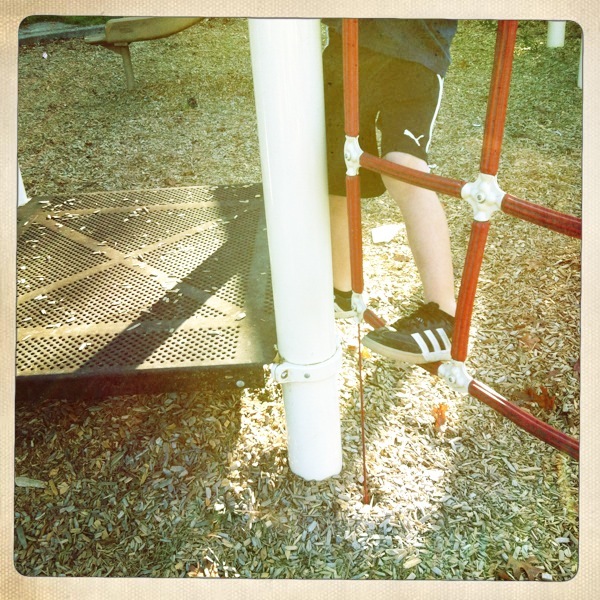 There is always that one part of a play structure where, no matter how new and up to code it may seem, you can imagine a kid just falling unceremoniously over the side, bypassing the sliding pole altogether. The monkey bars are still awfully high, and don’t even get me started on blisters. What if some big kid goes bananas on the wobbly bridge, and to be funny, wobbles the little kids right off? When we take the boys to San Francisco, they beg to go to a park that sits nestled in our old neighborhood. John and I watched our smiling eldest whose vantage point surely gave him a view of the Pacific Ocean. As I was standing there willing him to hold on, we turned to find a flurry of activity behind us. A mother was sprinting to a child who was spinning wildly out of control on a small seemingly benign stool. Little legs were flying around in a blur. It was Zachary. The woman had saved Zachary from spinning off in the direction of the sea, while I stood inches away concentrating on the kid in the sky. We thanked the hero profusely and checked on Zach whose face reflected nothing but shock after his centrifugal episode. He wondered off wordlessly leaning a bit to the right. I sat down, and pushed at the ground a little with my toe. Before I knew it, it was spinning and I was yelping, incapable of displaying the same stoic demeanor as my 6-year-old. I was at once horrified and amazed at the marvel of engineering. The unassuming little seat was simultaneously low to the ground and terrifying – the perfect combination for my peace of mind, and my child’s future emotional health and sense of accomplishment and adventure.